The important role of SEO in boosting the number of web browsers to a website is undeniable. Once online store owners can take advantage of SEO, they do not money to have a huge number of visitors. However, not everyone knows how to make SEO truly beneficial for their Magento merchants. Here are some advanced techniques for you to maximize the advantage of using SEO. Every online shop is afraid of facing duplicate content. One website, when being considered to contain identical content with any other page, will be marked as an unreliable site by the spiders. As a result, the web page link cannot gain high position in the search engine result pages (SERPs). To address this problem, shop admins have three choices: create robots.txt file, make 301 redirect, or set Meta tags as “noindex, nofollow”. However, these above options only reduce the risk of duplicate content to a certain extent. 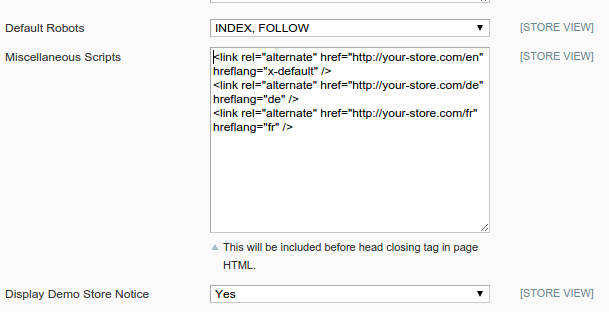 If store owners want to resolve this issue clearly, Mageplaza SEO extension is highly recommended. You can find more information on this configuration in this page here. Using appropriate keywords is one of the determining factors contributing to the success of SEO. Therefore, make sure keywords and a short description is filled in the field of metadata box in the Content Management System pages. Besides, remember to include minimum 5 keywords in the content to make sure that the spiders can easily identify the content of the pages. Another advice for shop owners to gain higher rank in the SERPs is pay attention to Meta descriptions. This part is often received no consideration from shop admins and they do not make any change in the field box. Consequently, duplicate content happens, that negatively affects SEO and placement in the SERPs. Therefore, store admins should go to System -> Configuration -> General -> Design -> HTML Head -> Default description and leave it empty. Besides, you should make sure that your meta keywords are not “magento” or “magento commerce”. Let change them to something meaningful or related to your products.